Not as much as I would like! 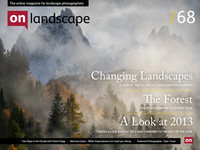 The pressures of my commercial work and the commitment to getting the pdf issues of onlandscape out, nearly on time, has often left me exhausted and that has meant precious little time for my own landscape work. My business took quite a knock after the last general election with the subsequent massive cut back in public sector spending. I spent a number of years rebuilding my commercial business and that made me a bit obsessive about grabbing every bit of work that I could. I am at the point now where I am getting a bit fed up with the fickle nature of some clients and looking for a little bit of a change in some aspects of my work. I really enjoy working with people and enjoy the prospect of helping them with their own creative development. I have been working as a designer and photographer (both commercial and art) now for nearly 28 years and hope I have something worthwhile to pass on. Of course I hope that I can find more time for my own art work which is my passion. I did find time to make a couple of trips to ‘a certain beach’ and added a few more images to that body of work.